Some of you know me as a software developer, but I also write science fiction and fantasy books in my free time. Since I'm an Egyptian author, and I like writing mainly in English – as opposed to Arabic – this poses a problem. Because 99.99% percent of my audience comes from English-speaking countries, or speak English as their secondary language. I publicly published two full novels in my writing career (one of which is now unpublished, unless you know where to look) before starting my ongoing web-serial about programmable magic, and I chose Amazon to publish them, after many requests from my audience who wanted the stories in e-book format. So I acquiesced. 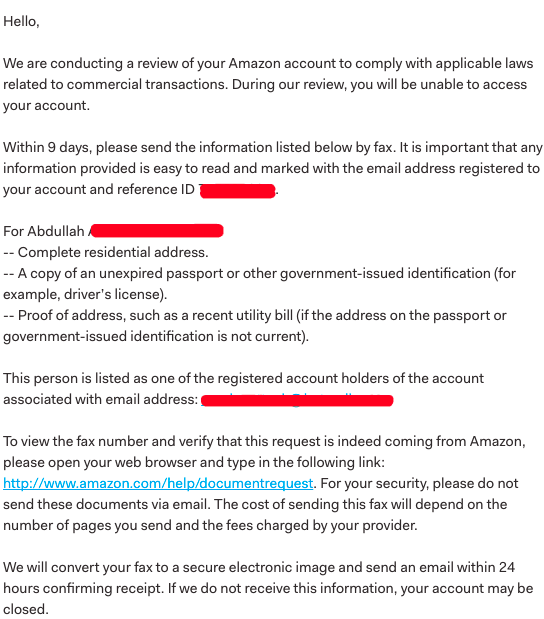 Upon registering as a new author, Amazon requested that I file my tax information, which I did as per usual. I chose the bank transfer method for payouts, and was told there was a minimum threshold for transferring the payment to my local bank account. Again, this is normal. Payoneer wasn't even an option back then. And so the books sold for a while, I didn't check too much, but the volume of sales decreased over time as people forgot about my stories and there stopped being an influx of new readers. I told myself that once that threshold is reached, no matter how slowly; I'd get a nice surprise in my bank account one day. I forgot about it and moved on with my life. In 2016, I spent around two harrowing weeks sleeping on benches at a hospital, and looking after my mother during her heart bypass surgery. There were some complications that turned me broke, both mentally and financially. But she soon made a recovery, and I was thankful for my good fortune and her improving health. We left the hospital and I went back home, to a big surprise. During that stressful period, I was in a complete information blackout with my phone dead, no access to a charger, and more importantly: no access to the internet, and guess what happened while I was away? I tried to log back into my Amazon account and to contact support, and to date: it remains locked. They didn't just lock down my access to Kindle Direct Publishing, the platform for authors, either. No, it was complete lock-down across all their services. I could no longer buy goods from Amazon, or use AWS services. This represented a big problem when I tried to use AWS while co-founding a startup later, you see. But that's another story for another day. I had no access to an international fax (which isn't only something outdated, but physically no longer available where I live). I tried replying to their email, but nothing worked. I was depressed and exhausted, and just let the issue drop. A couple of weeks later, I was updating my old writing site when I found the old Amazon referral links for my books. I accidentally clicked one, and found my books still listed. You see, Amazon refuses to sell digital books here in the Middle East, which I found to be problematic whenever I wanted to read, say, a KDP Select exclusive title. So, still curious, I hopped on a VPN to check the status of my books from a US-based IP address. …and found my books still on sale. Words can't describe how much faith I lost in humanity in that moment. Long story short: I had to forge my way in using an old cookie saved on the Chrome browser on my iPhone to unpublish my two books. I don't use Chrome on the phone that much, so that cookie must have survived all that time without being cleared. Books secure, and now selling exclusively on Smashwords and other channels through them, I moved on to bigger things in life. Then that project got some attention, and I spoke at Nordic.js about it later that year. Not more than a few months later, I get the following email, and my laughs echoed to the heavens as I realised the irony. 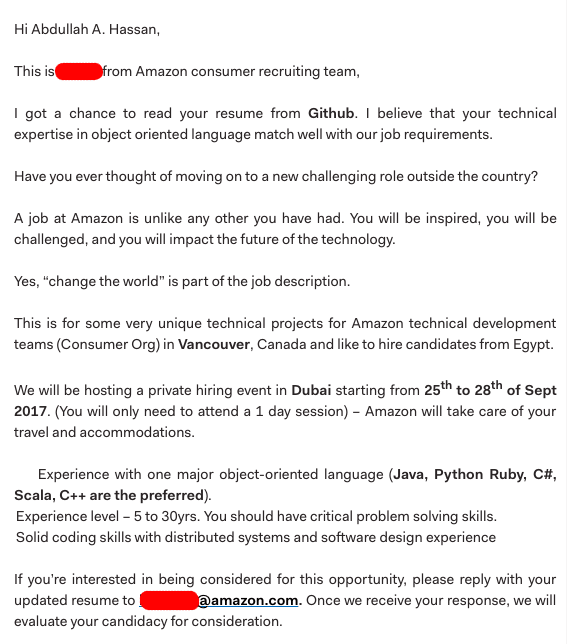 A job at Amazon is unlike any other you have had. You will be inspired, you will be challenged, and you will impact the future of the technology. I think that last sentence is inaccurate, because "screw the rest of the world" is more apt. I had considered accepting the invitation and costing them something before refusing, but I'm not a vindictive person by nature, and frankly I no longer care. I'm not alone in this either, as many a recently banned LitRPG author would attest. If you're an author, then beware; and if you're a developer: you're a potential new worker drone for the self-interested hive-mind of immoral bankruptcy. I'm also sharing this here because I've just completed the very first volume of my current series, The Magineer, with chapter 40 coming out publicly on Sunday the 30th. When my readers ask me to publish that volume on Amazon and KDP Select, I'll be posting a link to this little story. Stay frosty, and preferably a safe distance from Amazon and its ilk! What a frustrating experience. Gosh. It was just another drop in the bucket at the time, so I didn't really make a fuss about it. Now that I'm back on my feet again, I look back at that injustice and see how terrible of a situation this was. Anybody else in the same situation would have raised hell, but the big problem is complete helplessness. I mean, if Amazon did something like this to US-based author, would they expect to get away with it scot-free? Anyway, this will change nothing. Thanks for taking the time to read this, though! We can take up printing your work(s) on our service if that works for you. As an immigrant myself, I understand what it means to feel voiceless against a large US corporation, especially outside of US. I'm particularly sorry for you to not be able to reach your audiences through actions of the middlemen! Feel free to connect on mail marvin[Æ]bubblin[·]io and I also recommend you take a look at our open source book publishing tools that will help you go further than anything else. Hey, thanks for reaching out to me! I'm definitely going to check it out now. Arcvalues & package json unavailable Error: Did not find the arc! Frustrating yes, but perhaps not as cut and dry as it first seems. There may be restrictions they have to comply with which as large as they are, are outside of their control. I know they won't be brave enough to, but I'd love to see a representative of Amazon or any large company actually answer in non legalese or vox-political the accusations of customers, and lay out how they will stop failing them. 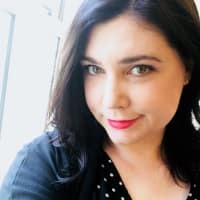 I completely agree with the restrictions part, but if their staff had to deactivate the account, they should have also de-listed or unpublished the books in the process. They never did, and I was in no position to do anything about it. This is what I'm really against. Absolutely was not a suggestion they did no wrong, nor that you did wrong buddy. I feel for you in this. I think I said how nice it would be for them to come publicly and give account of themselves (and also provide you with the revenue you enabled them to collect). Sadly I don't think they will do either. Yes, I agree with this assessment as well. There is definitely a lot going on here.